The Hippos going through training ahead of today’s game against Malawi. Courtesy photo. FOOTBALL–Uganda Cranes qualified for the semi finals of the CECAFA Senior challenge cup after a heard fought 1-1 draw against Ethiopia. The Cranes endured a long spell of frustration against the Walia Stars having gone a goal down as early as the 22nd minute when Abdel Abubeker fired Ethiopia into the led and Isaac Muleme got sent off in the with 10 minutes to play. KCCA FC striker Derrick Nsibambi saved the day with five minutes to go as he grabbed his third goal of the tournament to make sure that the defending champions do not have to endure the humiliation of being knocked out in the group stages. The draw means Uganda is now top of group B with five points from three games will Ethiopia’s hopes of progression hang onto a thread as the pray that Burundi loose by three clear goals against bottom South Sudan today evening. With Burundi on four points, Uganda can still finish second if the Swallows win their last group game. 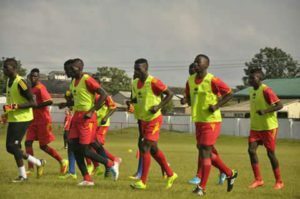 In Zambia, the national U20 side, The Hippos have need only a point to progress to the knock out stage as they host second placed Malawi at the Arthur Davis Stadium in Kitwe. Zambia and Uganda are locked on four points a piece at the top of group A having both won one and drew one of their opening two games. Both sides will go through with a draw as the other two teams(Zambia and Swaziland) have collected only one point since the under age South African tournament kicked off. “We are all prepared for the Malawi game today and our target is to get all three points. Said Head Coach Matia Lule. “We are unfortunate not to have our captain Shaban Muhammad unavailable for the game but we as Hippos work as a team so i think we can cope. Captaian Shaban Muhammad got sent off in the last game against Swaziland and is ineligible for selection against Malawi. Bul’ FC striker Hamis Tibita is expected to replace the KCCA FC striker today and hopefuly he(Tibita) can get the job done so as the Hippos get the desired result.